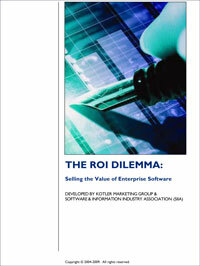 This report documents the “ROI challenge” that enterprise IT vendors and buyers face, and the various approaches taken to meet this challenge. It also points out overlooked opportunities to improve vendors’ value-selling strategies and tactics. Conducted in partnership with the Software & Information Industry Association, the study is based on survey responses from 220 IT vendors and more than 550 enterprise IT decision makers. How vendors' goals for using value-selling can get undermined in practice. "Given customers' focus on optimizing IT budget dollars, it's never been more important to communicate ROI. But too often vendors forget to listen as well. This report provides a healthy antidote -- a chance to hear the voice of the customer on this important topic."